I might have hugged this book and did a happy dance around the kitchen when this came in the mail. If it came down to books or chocolate, books would win. It was wonderful being with these characters again. I was able to lose myself and get into the world completely with this book. (I'm afraid for the first couple of books I was missing the original characters from the first Mistborn books.) But now I absolutely love Wayne and have strong affection for the rest. I especially enjoyed learning more of Steris and getting to know her. You've got to root for the girl who doesn't have any powers! I want to be very careful to avoid spoilers, so I'll be very vague. I felt like the setup/foreshadowing of the big twist was handled a little clumsily here. The little clues were inserted sort of jarringly, enough so that I picked them out and wondered why that statement was needed. Which of course proved to be the twist near the end. Sanderson handles action/fight scenes so well. The last third of the book shot along at a sprint pace. The parts leading up the finale could be a little slow, but never boring. Not with these characters. 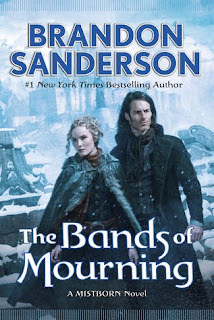 There are so many good parts about Sanderson books--the involved magic systems and their rules, the intense action, the sense of actual danger and peril--but the best is his characters and how real they feel. As always it left me dying to read the next! Five stars! I got an advanced copy from the publisher.